Lately, life has been pretty hectic for my husband and me. We haven’t been able to spend much time together, and funds have been pretty tight, too. Last week, we finally had the opportunity to enjoy a fun night out. What to do? What to do? Dinner and a show sound nice. A quick look at the bank account revealed “O” at Bellagio and dinner at Circo are simply out of the question. I needed a better fit for our budget. Not to worry, I recalled that Firefly, a popular tapas restaurant, opened a new location downtown inside the Plaza. I’ve been meaning to check it out, this was the perfect excuse. Next, I checked to see if I could make reservations with Opentable.com and sure enough Firefly was an option. For those unfamiliar with OpenTable, it’s a free website to make reservations online for select restaurants in Las Vegas and other cities nationwide, they’ve even added several international options. Not only is it an easy way to reserve a table, but you earn dining reward points for doing so. Those points accumulate and then they can be redeemed for dining cheques that are accepted by participating restaurants. We use OpenTable whenever possible. We recently received a 2-for-1 admission coupon from a monthly home-mailer for The Comedy Stop at the Sahara. Regular price tickets for locals are only $19.95 plus taxes and fees. Additionally, they have shows nightly at 9pm. That settled it, after dinner we’d take in the comedy show. It shaped up to be a great date night. The newest Firefly Tapas Kitchen and Bar is located in the dome on the second floor of the Plaza. Years ago, the space was Center Stage Restaurant. We enjoyed a few steak dinners there. Back then, it had a vintage Vegas feel – so much so it was used in the movie Casino – and the dome provided excellent views of Fremont Street. The views and U-shaped booths remain, but the décor has certainly changed. The bar and dining room now flaunt deep reds and dark woods, creating a much more modern and hip vibe. 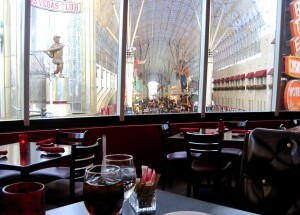 Upon arrival we were greeted with a smile, and then led to our table overlooking Fremont Street. We took a few moments to look over the menu, and asked our server for recommendations. She happily named a few of her favorites and suggested we each choose 2-3 plates. We made our selections and soon our smorgasbord was underway. 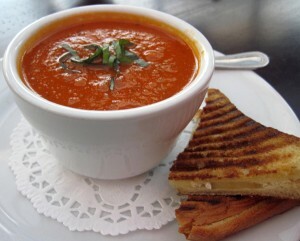 We started with velvety and flavorful tomato-basil soup served with grilled brie sandwich bites and bacon wrapped dates. The dates are Firefly’s signature dish. For years I heard people rave about them and I swore they couldn’t possibly be that good, but I was wrong. They are. We ordered two, because we devoured the first plate so quickly. They’re a wonderful balance of salty, sweet and savory. Do not pass these up. Next, we sampled pork empanada with salad, chicken skewers, calamari, mac’n manchego cheese, and baked cheese – a queso with chorizo. The calamari was a bit chewy, but everything else was quite good. The manchego cheese and shells were rich and comforting, we loved the twist on this classic. We finished with sweet treats for dessert. Banana-Nutella wedges and a selection of gelato: vanilla, chocolate and pistachio. You can never go wrong with Nutella and these wedges did not disappoint. The gelato was refreshing end to a delicious meal. Bellies full we left downtown and headed to the Strip to see The Comedy Stop. We’re familiar with the show; we’ve seen it a few times at its former home the Tropicana. The show now resides at the Congo Room inside Sahara. The new digs offer more comfortable seating, tables and theater chairs, but your first cocktail is no longer included in the ticket price. That was a nice perk over at the Trop. Wherever home is this comedy show brings three comedians to perform each week. They claim to have the best talent on the circuit. We saw Jimmie “JJ” Walker, Paul Lyons and Greg Vaccarello. Paul was a riot, he really got the room going. Each comedian has their own style so there is something for everyone. It’s sure to please. We had a wonderful night out filled with laughs; it was especially nice that it didn’t break the bank. One hundred bucks doesn’t often go far in Vegas when talking food and entertainment in Las Vegas, but that’s all this date night set us back. Can’t get your hands on a 2-for-1 coupon to The Comedy Stop? No problem, fortunately, Goldstar.com offers half-price tickets. The website offers discounted tickets to a variety of Las Vegas shows. Check it out. 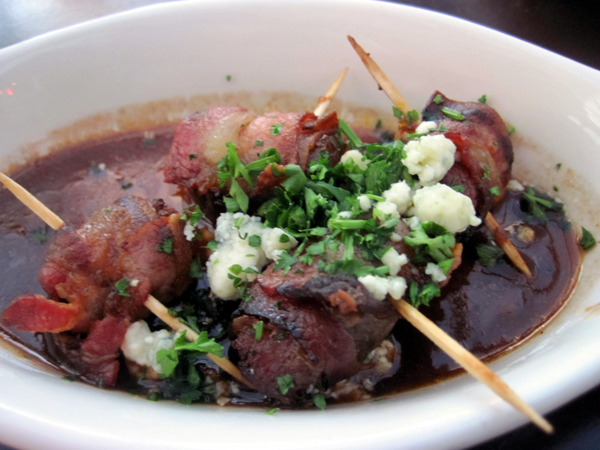 Those bacon-wrapped dates looked truly sinful and delicious, and the tips for a night spent laughing and dining well are very appreciated in this day and age. Tapas are the solution to a tight budget in difficult economic times. A couple of tapas plates and a bottle of wine is the perfect start to an evening in Las Vegas. This sounds like a great evening! I haven’t been to either Firefly or Comedy Stop, but now I’ll make a point of it. Thanks, Kellee! I’m already craving those bacon wrapped stuffed dates. Next visit I’ll have to try their Sangria. I hear it’s wonderful. Tapas is great way to sample a variety, plus you can really customize a meal to your appetite or budget. We took some guests here last weekend. And, those dates are truly outstanding. Very nice meal and good service! Glad to hear it! We’ve been back half a dozen times. Turns out I like their white Sangria better than the red, and the dates, artichoke toasts and stuffed mushrooms are all musts from now on.